Every morning, when I awake, the first thing that comes to my mind is gratitude—gratitude that I have another day to make a contribution and serve. A day is made up of 86,400 seconds. Life slips away second by second, so we should seize every second to make positive contributions and to form good affinities with others. Every second is to be cherished with gratitude and each moment lived with pious sincerity and vigilant care—never blindly or mindlessly. Should we freely let greed into our hearts, this insatiable greed will lead us to make many wrong actions and create much negative karma throughout the course of the day. How we live our lives depends on our mindsets, on our ways of thinking. A single unwholesome thought can lead to irrevocable consequences. On a small scale, unwholesome thoughts can harm us and our families. On a larger scale, such negative thoughts can damage society, the nation, or even the whole of mankind. We have no control over the lengths of our lives, but we can decide their depths and breadths. That has to do with the values we endow our lives with. For instance, what have we done that is of benefit to society? Have we grown in wisdom? Have we helped make positive differences in the lives of others? These are things to reflect on at every moment. I hope we can all take the Dharma to heart and safeguard our minds from such pollutants as greed, anger, delusion, arrogance, and doubt. We should cleanse all that is deleterious from within and actively strive to lead virtuous lives. Let us sow seeds of love in our minds and make the best use of our lives by never missing a chance to do good and by taking good care of our parents. Only then will we be able to grow in wisdom and create valuable lives. 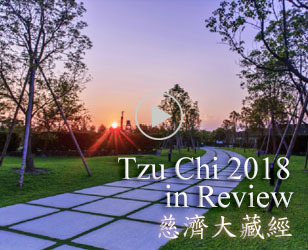 On the Sunday before Chinese New Year’s Eve, the winter sun shone brightly at the Jing Si Abode in Hualien, the headquarters of the Tzu Chi Foundation in Taiwan and the spiritual home of Tzu Chi volunteers. The atmosphere at the Abode was warm and cozy as Tzu Chi long-term care recipients in Hualien gathered to enjoy a traditional year-end meal. Young and old sat around tables under tents or trees enjoying hotpots and other delicious dishes. Teachers and students from Tzu Chi University, high school, and elementary school sat with our care recipients at each table to keep them company. They chatted with the elderly and helped get them food. Children from Tzu Chi Kindergarten and members of the Tzu Cheng Faith Corps sang and danced and put on plays to entertain the care recipients. It was like a heartwarming family gathering. The tradition of holding year-end meals for our care recipients began when the Abode was inaugurated in 1969. In that first year, there were only 15 tables, each seating ten guests. This year, there were 160 tables in the Hualien region alone. 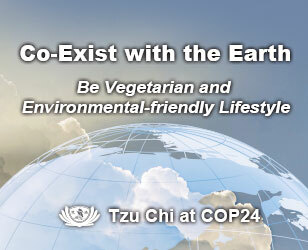 Tzu Chi hosted a total of 29 meals throughout Taiwan. The number of Tzu Chi care recipients in Taiwan increased by 40 percent in 2008, primarily due to the economic recession. The total number of those receiving monthly financial aid from Tzu Chi now exceeds 12,000. Tzu Chi members treat each care recipient with love and respect. This attitude of respect is fundamental in Tzu Chi’s charity work. Respect is shown in the care we take with the Chinese New Year gift packages for our care recipients. Each item, be it food or some daily necessity, is carefully chosen. It has to be useful for our care recipients and of the best quality. All of the items are then packed very neatly, to express our respect and sincerity. Although our care recipients are financially poor, they have come to realize that even in their poverty, they can still give. For example, there is a single mother in Hualien who receives monthly financial aid and material supplies from Tzu Chi. Every month she donates NT$400 (US$12) to Tzu Chi, and when she has free time she helps out at the Abode with picking vegetables or making candles. At the meal, she donated an extra NT$200 to help those needier than her. Meanwhile, in Taichung a care recipient brought home-grown vegetables to a year-end meal to share with others. In Pingdong, local care recipients made traditional Chinese New Year desserts to contribute to the meal. Those who know to be content are the richest. I’m full of gratitude to see care recipients giving back to help others. At the end of last year and the beginning of this year, Tzu Chi volunteers traveled to twelve counties in six provinces in mainland China. They personally handed out rice, oil, flour, sugar, salt, cotton-padded coats, comforters, and other winter supplies to elderly citizens without families, physically challenged people, and impoverished families. Many aid recipients were moved to tears; they said the supplies were the most precious presents they had ever received. Their lives were harsh, but they did not complain and were easily contented. Though what we gave them was not much, they were already very happy. The happiness wasn’t from the goods they received, but from the love and care they felt from Tzu Chi volunteers. Their hearts were warmed, and that is a happiness greater than anything money can buy. In Guizhou Province, China, there is a region called Mashan. The land there is too infertile and rugged to cultivate crops. Throughout history, it has been a land of poverty. Up until 11 years ago, 90 percent of the region’s children could not afford to attend school. Tzu Chi began providing scholarships so local children could receive schooling. As of January 2009, 40,000 scholarships had been awarded. Because of the opportunities education has opened up for them, life has begun to change for these families, and they are finally able to break free from the cycle of poverty that has plagued Mashan. From this, we see that it is possible to change history—so long as people’s hearts are at peace, no matter how poor they are, they always have a chance to improve their lives. But in the Middle East, the picture is very different because of the long-standing hatred and fighting between Israelis and Palestinians. At the beginning of this year, the fragile peace was again destroyed as open clashes broke out in the Gaza Strip, endangering the lives of innocent civilians. It was heartrending to see families shattered and so many wounded and killed. What kind of hatred is there between these people? Now, even if one side did win, peace still would not come to the area, and the civilians still would not be able to live in peace. The enmity between the two sides just runs deeper and deeper, and more seeds of hatred are sown into people’s consciousness. It is like planting many landmines in the mind—just one slight touch and off they go, with disastrous consequences. Landmines in battlefields can be removed, but it is far more difficult to get rid of the landmines in people’s minds. All resentment, enmity, and hatred stem from the ignorance and delusion in our minds. Continually filling our hearts with goodness and learning the ways of goodness is the only way to cleanse away these inner delusions and impurities. And only when people’s minds are peaceful and balanced and people care for one another with Great Love can our world truly flourish. Haiti has long known dire poverty. Half of her population is chronically hungry and malnourished. A series of hurricanes since last August has made people’s lives even worse. 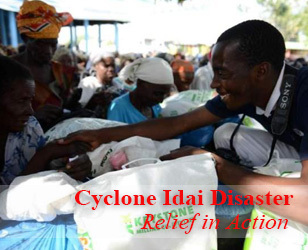 On January 15 and 16, 2009, Tzu Chi members from the United States, the Dominican Republic, and St. Martin held a large-scale aid distribution in Haiti. More than 3,300 families benefited. Because of the severe hardship these people have been enduring for many years, sometimes when aid distributions were held by other NGOs, chaos broke out as people pushed and shoved in the scramble for aid supplies. Concerned that this might also happen at Tzu Chi’s aid distribution, our volunteers mindfully planned and organized the distribution with wisdom and love. They began laying the groundwork before the distribution by going door-to-door to visit people who lived and did business near the distribution site. They wanted to first extend their goodwill to these people who might be inconvenienced by the distribution, as some parts of the streets would be cordoned off during the distribution. The volunteers apologized for this and explained to the residents and shop owners how their concern for the Haitian people had brought them to Haiti to hold an aid distribution. As a gesture of their sincerity, the volunteers gave each family one of Tzu Chi’s thermal blankets. Thankfully, because of this communication, the locals were very understanding. At the distribution, Tzu Chi volunteers entertained waiting aid recipients with songs, so their wait would not be so hard to bear. Children even danced along to the music, and the atmosphere was full of joy and harmony. This helped to prevent chaotic pushing and shoving during the distribution. When handing over the relief goods, volunteers bowed deeply and respectfully to each recipient. Such a sincere display of respect touched many. Because of the respect and love that Tzu Chi volunteers showed the local people, when the distribution ended, many locals stood on the roadside or climbed onto their roofs to see the volunteers off and wave them goodbye. The volunteers’ sincere care and respect had touched their hearts and brought forth their gratitude. Actually, the love of Tzu Chi volunteers had already reached Haiti ten years earlier. In 1998, Hurricane Georges swept across the Caribbean, devastating many countries in Central and South America. Tzu Chi immediately responded with a clothing drive and sent 60 cargo containers of cleaned and neatly folded used clothes to the area. Four of the containers went to Haiti. This most recent relief distribution in Haiti was actually a pilot project. While in Haiti, volunteers also took the opportunity to find out more about local medical and educational needs to see what more Tzu Chi could do to help the country in the future. Last year, a school in Port-au-Prince, the capital of Haiti, collapsed due to its poor, unsound structure. The accident happened during school hours and took the lives of nearly a hundred children. When Tzu Chi volunteers visited the school, they found that it had been poorly built using simple materials, a common problem due to the country’s widespread poverty. To accommodate more students, more classrooms had been added on top of the older ones. The extra weight eventually led to the collapse of the building. I heard that another school collapsed sometime after this incident as well. From this, we can see how urgent the need for sturdy school buildings is. Every one of us has wisdom and love commensurate with that possessed by the buddhas, so we are able to love others and to cherish ourselves with self-respect. Love can inspire compassion, and compassion can bring forth wisdom—this is the principle behind our work in Tzu Chi. I hope that this relief distribution will continue the connection we formed with Haiti ten years ago. I hope through our work, we can spread seeds of love in that country and help these seeds take root. In this way, the needy in Haiti can truly get the help they need to get back on their feet. Nothing is impossible as long as we set our minds to it with the spirit of the Four Immeasurables—loving-kindness, compassion, joy, and equanimity. Carrying out humanitarian work in Haiti is not easy, but Tzu Chi volunteers willingly shoulder this mission. For the volunteers, as long as people’s suffering can be relieved, no matter how tiring the work is, they will have no complaints or regrets. This comes from the loving-kindness and compassion they have. With the spirit of joy and equanimity, their minds will not be troubled and they can undertake the work selflessly, without seeking anything in return. Because of this, they are able to vigorously meet and overcome the many challenges of aid work. Because Tzu Chi volunteers cannot bear to see others suffer, they willingly endure all weather conditions to visit areas of suffering and help the people there. All across the world, they are doing this in order to give love and spread seeds of goodness. It is like a relay—just as some volunteers are about to call it a day in one country, other volunteers are starting a new day of giving in another. At every single moment, touching stories are taking place. This fills me with gratitude. We are in the start of a new year. I hope everyone can bid goodbye to the past year with gratitude and welcome the new year with appreciation—appreciation and gratitude for every moment and every person we have in our life. Let us cherish the peace and well-being we have and do our best to contribute to the welfare of the world. Let us always be mindful.